Squatter Coffey Life has been a bit hectic of late. Many months ago I received an email suggesting I have an Australian by the name of Squatter Coffey on the show. As I do with all your suggestions, I try to contact the person and see if they want to be on the show. Squatter did agree to come on the show, but we couldn't find a convenient time. You see, Squatter Coffey lives way out in a "rural" area of Australia. The time difference would have one of us up in the middle of ... See More the night. We agreed that we would get together when his season changed. It's just now turning spring in Australia and Squatter, who owns and operates a bush trail riding company, is entering his good riding season. A Life with Horses Squatter Coffey has been riding horses so long he doesn't remember "learning" how to ride. He has just always ridden. Squatter grew up in a family of horses. His 6 siblings are all in the horse business. Squatter raced horse, worked on stations and has done just about everything you can do on a horse. While it's sometimes difficult to find something to talk about, Squatter and I share a common love of horses and horsemanship. He has some good stories and he shares his experiences on the show. I hope you enjoy Squatter Coffey. Contact Us We have well over 200 episodes up now and you can find them all for free on iTunes, with our Android App in the Amazon store, and now Stitcher, or wherever podcasts are distributed. Get the Stitcher app and tell us how it works. We are on Google Play too! You can also find every episode and more about the show at whoapodcast.com. Please take a moment and join our email list. Get in on the conversation with Facebook and Twitter and Instagram- just look for WhoaPodcast. You are a big part of why we do this podcast. We really love getting your feedback. Please let us know your thoughts, ideas, and suggestions for the show. 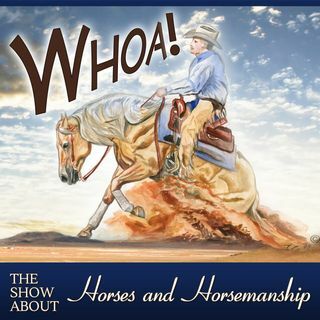 You can email us at John@WhoaPodcast.com Thanks for listening, John & Ranae Episode #137 Support the Whoa Podcast with this Amazon Link.